By The Shore Stamping with Jen Pitta: Happy New Catalog Day.... and a Valentine Special! Happy New Catalog Day.... and a Valentine Special! Guess What? Today is THE day. The new Spring Catalog is live and ready for you to drool over! I've been playing with new products from this fabulous catalog for the past few weeks and I am in L.O.V.E. Go ahead... check it out for yourself. I'll wait. Awesome, yes? Want to sweeten the day a bit? Check out these two special Valentine's Day offers... so, so cute. In bundle 1, you receive the exclusive "Happy Heart" single stamp and a package (50) 1 X 8 cellophane treat bags for just $5.95. It's perfect for creating little yummy "love" treats for a lucky classroom or just some lucky friends. The second bundle also has an exclusive stamp set called "My Little Valentine." 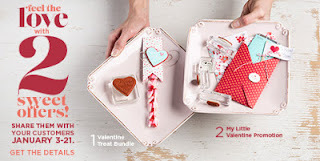 With the purchase of that cute little set for just $9.95, you'll receive the Sealed with Love Simply Sent Kit from the Spring catalog for free ($7.95 value). Check out all the details here. Want to shop right now? Click here to go right to my online store.